At Canlis in Seattle, Best New Chef Brady Williams balances classic components with modern techniques. For his Barley Crêpes with Cabbage and Sauce Pierre, Williams envelops grilled fermented cabbage in a savory buckwheat crêpe, accompanied by rich sauce Pierre. 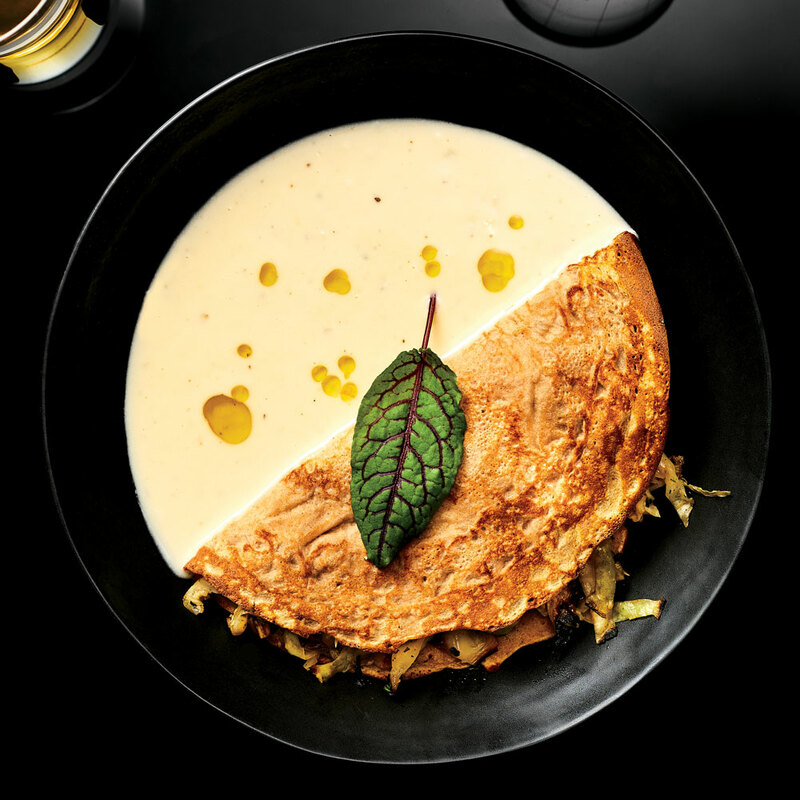 The cabbage in this barley crêpe calls for naturally fermented Japanese ayu fish sauce. Sweeter and milder than the Vietnamese version; ayu fish sauce is available at well-stocked Asian grocery stores and at tokyocentral.com. You can order the shio koji and black vinegar in this recipe at amazon.com. Combine 2 quarts water and salt in a large bowl, stirring until salt dissolves. Add cabbage quarters, and weigh down with a plate to completely submerge. Cover with cheesecloth, and let stand at a cool room temperature of 65°F to 70°F 5 days or up to 7 days. Heat a grill pan over medium-high. Drain cabbage, and pat dry. Using thyme sprigs as a brush, brush cabbage with oil. Place cabbage on lightly oiled pan, and grill, turning occasionally, until charred on all sides, 10 to 12 minutes. Chop charred cabbage. Place 31/2 cups chopped cabbage in a large bowl; reserve remaining cabbage for another use. Add shio koji, lemon zest, lemon juice, kurozu vinegar, dill, and fish sauce to chopped cabbage; stir to combine. Whisk together milk and eggs in a large bowl. Add flours and salt; whisk until completely smooth. Heat an 8-inch nonstick skillet over medium; brush lightly with clarified butter just to coat bottom of skillet. Add 3 tablespoons batter, and swirl to evenly distribute batter. Cook until bottom is golden brown, 45 seconds to 1 minute. Flip and cook until crêpe is set, about 15 seconds. Remove crêpe, and repeat with remaining batter to make a total of 8 crêpes. Melt 1/4 cup chilled butter in a medium saucepan over medium. Add shallots, and cook, stirring often, until translucent, about 3 minutes. Add vermouth, and cook until reduced by half, about 15 minutes. Gradually add remaining 1 1/2 cups chilled butter, whisking constantly, until all butter is incorporated and sauce is emulsified. Whisk in cream, Worcestershire, lemon juice, salt, and pepper. Place about 1/3 cup fermented cabbage on bottom half of 1 crêpe, and fold over to create a half-moon. Place crêpe in a shallow bowl with folded edge in middle of bowl. Pour about 1/3 cup sauce Pierre into bowl along the folded edge of crêpe, filling empty side of bowl. Repeat procedure with remaining crêpes, fermented cabbage, and sauce Pierre.